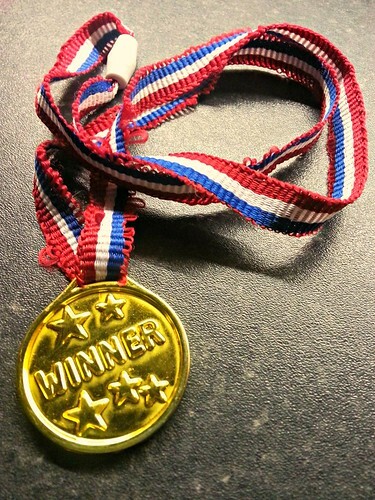 If there was some sort of medal for world’s pickiest eater, my son would wear it with pride. Unless of course it was edible because then he wouldn’t go near it. It wasn’t always this way. William couldn’t wait to start weaning; he’d watch us intently as we ate, would gnaw on his fists and was forever putting things into his mouth to ‘taste’ them (mainly socks and soft toys). He wolfed down his first small bowl of baby rice and loved any kind of puree that was put in front of him. I worried about him back then, although for the opposite reason I do now. When he was a weaning baby he just wouldn’t stop eating. The onus was on the adult to decide when enough was enough otherwise William would’ve happily chomped through bowl after bowl. Now, we find it difficult to get him to even look at most foods. I can count the food that he likes on one hand and even then it’s woe betide anyone who over-cooks them, even very slightly. Vegetables are a total no-no (although he has recently taken a shine to carrot and potato mash); fruit will only be consumed if it’s pureed (but not if he’s seen me doing it) or presented as fruit juice; bread is his nemesis and don’t even get me started on cheese and other dairy products (although yoghurts are popular). However, now and again we do have the odd surprise (like when he was confronted by chicken korma and ended up clearing his plate!). Looking back, things potentially started going awry when I introduced the idea of self-feeding…but possibly even before then. William never took to baby-led weaning and much preferred being fed to him having to do it himself. As he grew older and graduated onto more lumpy foods, William liked to hold a spoon and would try to have a go now and again, but continued to expect the vast majority to be delivered directly to his mouth by mum or dad. To this day he prefers using his fingers to a knife and fork, despite our best efforts to teach him otherwise. 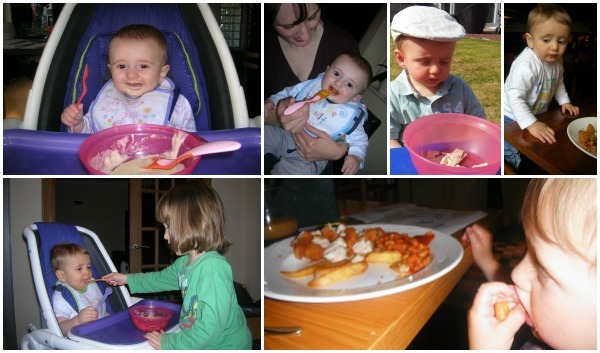 We’ve always tried our best to place a variety of meals in front of William, from the weaning stage onwards. I have always tried to make sure that, as a family, we all eat the same meals whenever possible and that fruit and vegetables are always readily available. It’s what my husband and I did when we weaned Olivia and it worked exceptionally well. We have a mantra of ‘try a little bit of everything’ and she’ll give almost anything a go. I suppose this is an example of how different children – even siblings – can be and how something that might work for one doesn’t work as well for another. Last month, I took William to his 2-and-a-half-year check-up with the health visitor. She was impressed with his physical and mental development, but we also spoke about his fussiness when it came to food. She measured his h8 and w8 and decided to refer him to a nutritionist as both were less than would normally be expected, according to past measurements in his red book. 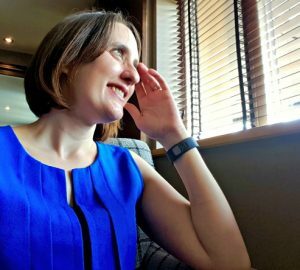 Our appointment was at the end of last week and I went along with William and my husband, an air of trepidation gently surrounding us. Despite all my worries over the last year or so, the appointment was actually very reassuring. 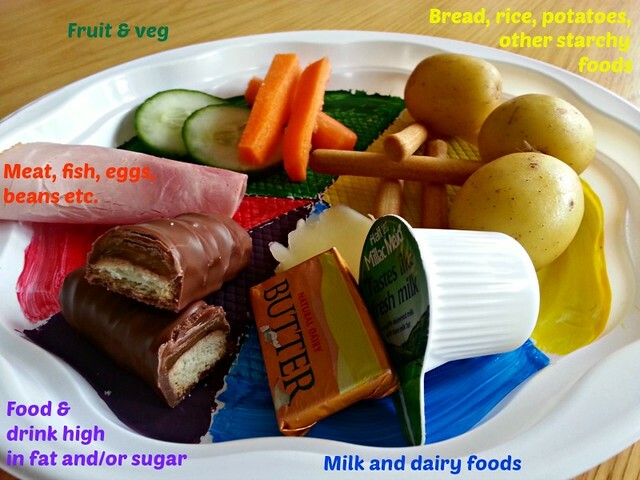 The nutritionist showed us a picture of the ‘eatwell plate’ – a diagram created by the Food Standards Agency to highlight the proportion of food groups young children should be consuming – and I realised that although William may not try much, he does eat foods from all these necessary groups. This means he’s not going without any particular vitamins because of his diet – I can’t tell you what a relief that was to hear! If you’re not overly familiar with the ‘eatwell plate’, here is a picture of my very own home-made version. It’s definitely worth looking at if you’re not sure about your child’s diet. As I said, I found it very reassuring. Do introduce food through play. If you want your child to try new foods, think about allowing your child to look at and handle them without any pressure on them to eat. A way to do this is through play (for example, making collages using dried foods, cooked spaghetti etc.). This will let your child become familiar with the look and feel of new foods and might well encourage them to give them a try when they’re next put onto their plate. Don’t fill your child up on drinks. You wouldn’t dream of letting your child eat continuously throughout the day, so don’t let them drink continuously either. The fluids they consume, whether it’s milk, water, squash or fruit juice, will fill a child’s small stomachs and send signals to the brain telling their body they are not hungry. Try to limit drinks to mealtimes, but if a child really is thirsty between meals, offer a choice between milk or water. Do make mealtimes a social experience. Eat together as a family as often as possible. Switch the television off and take the opportunity to chat as a family. Ask questions about anything except the food on their plate. Another way to make mealtimes sociable is to try food from each other’s plate and make a big deal on how delicious it is. Offer some of your food to your child and ask if you can try some of theirs. If they see others enjoying food, they may feel as if they’re missing out on something good and will be more willing to give new foods a try. Don’t nag or get upset if your child makes a fuss. By focusing on the fact that your child isn’t actually anything, or not eating very much, you’re giving your child negative attention. As we all know, children are clever little things and once they realise how to get your attention, they’ll keep on doing it. The best thing to do is to ignore any tantrums your child may have about the food on their plate. Don’t nag them to try something; it’ll make them more hesitant. Also, if they want to leave the table without eating anything, let them do so. However, you should try to explain that everyone else will be staying at the table to eat their meals and then make the meal last longer than usual. This will make your child feel like they are missing out. Eventually they might want to sit at the table with everyone else and maybe even try some of the food on their plate. Do emphasise how yummy your meal is. Instead of nagging and turning mealtimes into a negative experience, be over-the-top in emphasising how yummy the food on your plate is. 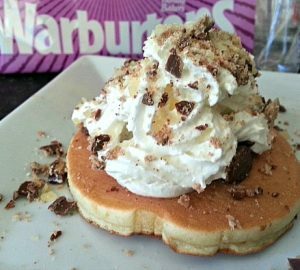 Don’t ask your child to try it, simply nibble on a particular foodstuff and something along the lines of, “Oh wow, this is delicious”, “This is sooo yummy”, or “I love this, it’s so nice”. It’s another tactic to make your child feel as if they’re missing out on something wonderful. Don’t let mealtimes last for an eternity. It can be tempting to make your child sit at the table for however long it takes until they eat their food, but this benefits no-one because it can make everyone feel stressed out and leads to nagging. Instead, set a deadline for when ‘the kitchen will close’ and stick to it. If your child hasn’t eaten anything in that time, don’t worry. Just remove their plate and tell them that the mealtime is over. You could keep the meal back for a certain amount of time so that if your child maintains they’re hungry, you can present them with the meal they originally turned down – if they’re genuinely hungry, they will eat (they may refuse out of stubborness to start with but, if you’re consistent. they will come to realise there are no negotiations to be had and should eventually give in). Do make a fuss when your child tries something new. Just as important as not ‘rewarding’ your child with attention when they refuse to eat is praising them when they do try something new. Consider buying a reward chart to encourage them. They could be given stickers for things like tasting a new food for the first time (even if it’s just a lick) through to finishing their entire meal. 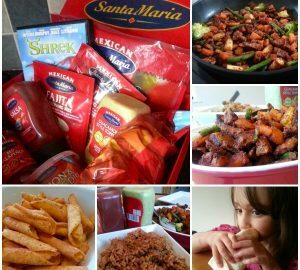 Have you got experience of a fussy eater? Do you have any more tips for encouraging them to try more foods? Or do you think it’s just a phase all children go through and grow out of on their own?